Ok, so whilst I admit that I am completely smitten with fabric lampshades and metallic lampshades, I can however appreciate the fantastic creativity of other alternative shades. One that has really grabbed my attention of late is Kate Hollowood’s bespoke sculptural lighting which she creates in her studio in Royal Leamington Spa. Her aim is to “create visually striking, engaging, functional statement pieces,” an aim which in my opinion she has really succeeded in! The ‘Matrix’ material she uses, which she has personally designed, creates a wonderful play of light and shadow in it’s surroundings. I thoroughly recommend exploring her work and methods over on her website. 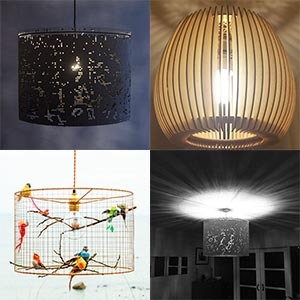 Another fantastic example of alternative lampshades is the Wooden Lasercut Lampshades range. I stumbled upon these whilst doing some lampshade research on Instagram – and they fully grabbed my attention. Created by Adam Clarke for Legacy Lasercrafts, the range “create a fantastic focal point, and cast mesmerising and intricate shadows on the ceiling and walls.” The shades also have additional delicate patterning on the top which adds another dimension to the play of light and shadow. And last but certainly not least, some very unique birdcage lampshades designed and handmade by Kekoni. Kekoni have a really lovely etsy shop which you can visit here. But be warned…you WILL want to purchase one.